Established 14 years ago, Janz Audio is a premier distributor of professional audio solutions for location sound and broadcast in the Czech Republic, and has now been appointed by CEDAR Audio to represent it in those markets. 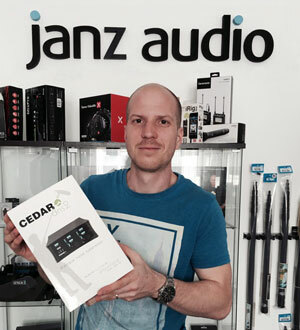 Gordon Reid, Managing Director of CEDAR Audio, says of this appointment, "We met the people at Janz Audio following the personal recommendation of one of our location sound customers in the Czech Republic. It turned out that Jan Zastera was already aware of CEDAR, and had been very impressed with the DNS 2 dialogue noise suppressor when he tried it at the IBC Convention the previous year. It was therefore a very short road from initial contact to signing up his company to represent us, and we're delighted that more location sound engineers and broadcasters in the Czech Republic will now have access to CEDAR products." Jan Zastera, the founder of the company says, "We established Janz Audio in 2004 specifically to focus on providing the best possible equipment and support for location sound and broadcasting in the Czech Republic. We love what we do, and we always do as much as we can to help our customers to obtain the best possible sound. This is the reason that we are so excited about CEDAR's products. We believe they will do a great job for our customers."